During a casual conversation with coworkers, someone let slip that they had a deep-fryer at home. I felt my mind snatching this slip of information from mid-air and filing it away for future intentions. Seasons later, I realized I was going to be going through yet another Chicago rainy fall and winter and that this former Texan needed something stronger than hot tea and wooley socks to get out the door and to work. I needed doughnuts to go nuts for. 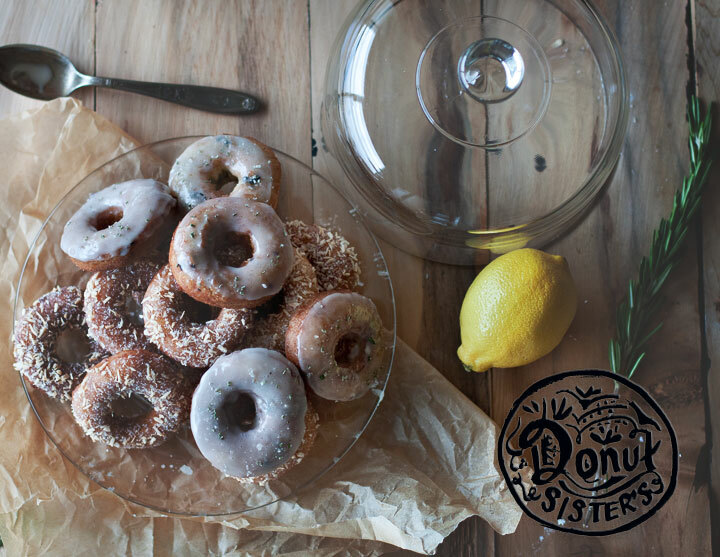 Because doughnuts are becoming a popular item to buy in both intimate corner bakeries and restaurants offering fine dining experiences, or perhaps through kismet, I ran across a doughnut cookbook in the library that turned out to be excellent for its base recipe and new ideas. 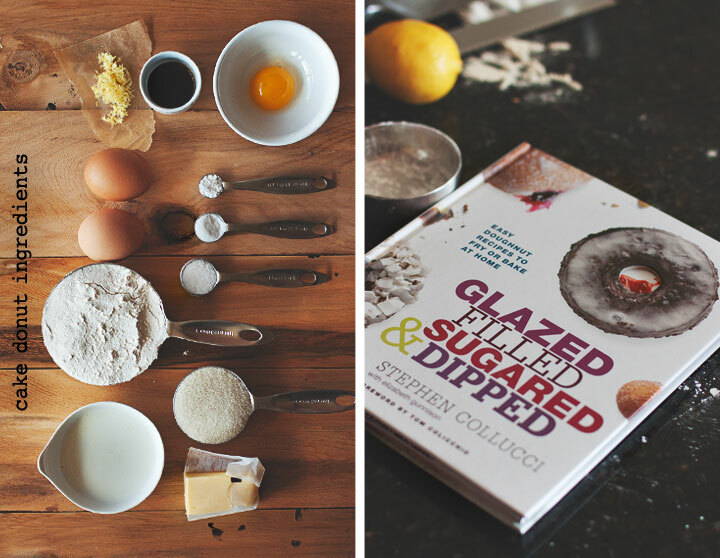 ‘ Glazed Filled Sugared & Dipped’ by Collucci. 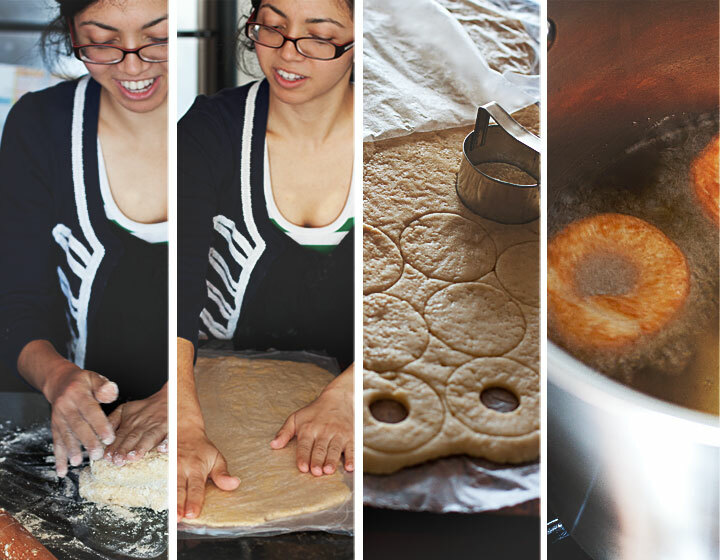 Joann and I flipped through the book, throwing out a rabble of doughnut ideas…whatever popped into our heads. 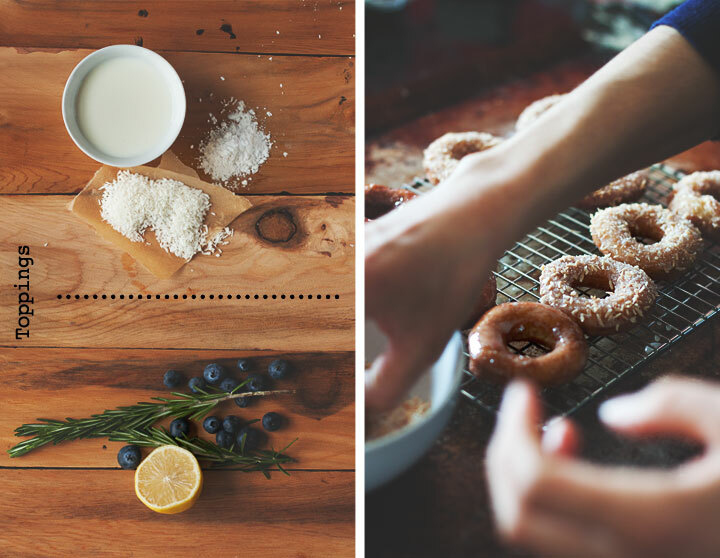 We quickly decided to use the same cake doughnut recipe to learn and experiment with two different flavor variations, Roasted Coconut Sugar doughnuts for her, Rosemary-Blueberry for me. 2) Gather dry ingredients together in a bowl: flour, sugar, baking soda, baking powder, salt, and lemon zest. 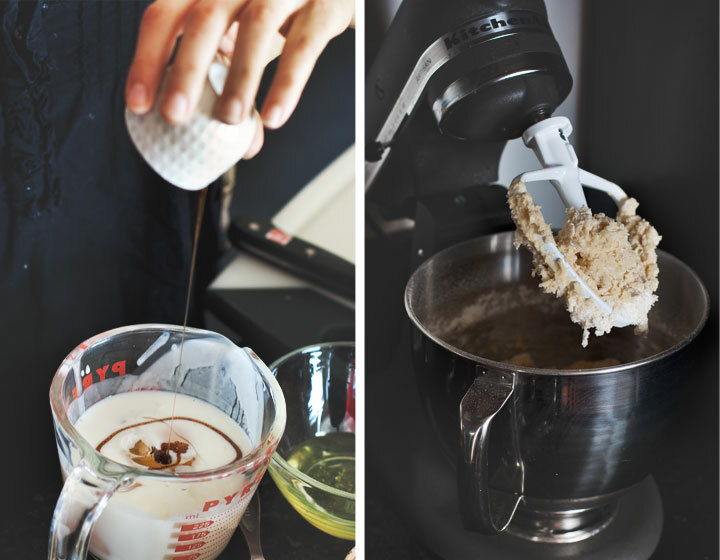 3) Pour into a standing mixer with the paddle attachment. Turn the mixer on low for a couple of turns to help mix everything together. 4) Add the following wet ingredients: whole eggs first, mixed for a few turns, then the egg yolk, buttermilk, butter, and vanilla. 5) Mix until it comes together as dough that can stand by itself. 6) Scrape the dough onto parchment paper or plastic film set on the baking sheet. Roll out dough until it is somewhere between 3/8 to ½ in thick. Top the rolled dough with a second piece of parchment or plastic film. Refrigerate the dough on baking sheet for 30 min to 1 hr. For all the fuss over the deep-fryer, we ended up not using it, but enjoyed compete success with a deep stock pot. 7) Heat at least two inches of oil in the stock pot until it is 350 degrees. 8) Cut 2 ½ to 3 in. doughnut rounds. We had a biscuit cutter and used a the wide part of a metal piping tip to make the doughnut holes. Use what you can if you don’t have a doughnut cutter. 9) Fry several doughnuts together, but not so many that the pot becomes over crowded and it becomes difficult to flip doughnuts one at a time. Fry a minute per side. 10) Remove and set on paper towels. A basic glaze was very simple and quick. 1 cup of confectioners/powdered sugar mixed with two tablespoons of milk or water until the lumps are gone. I made a topping station so I could quickly dunk the tops of the doughnuts in bowls of garnish after first dunking them half-way into the glaze. My rosemary was ¼ cup chopped fresh rosemary and 2/3 cup sugar. Joann’s roasted coconut topping was a mix of ½ cup unsweetened coconut flakes, roasted golden brown in the oven, 2/3 cup sugar, and a pinch of salt. This made a cup and was enough to use on all of her doughnuts. 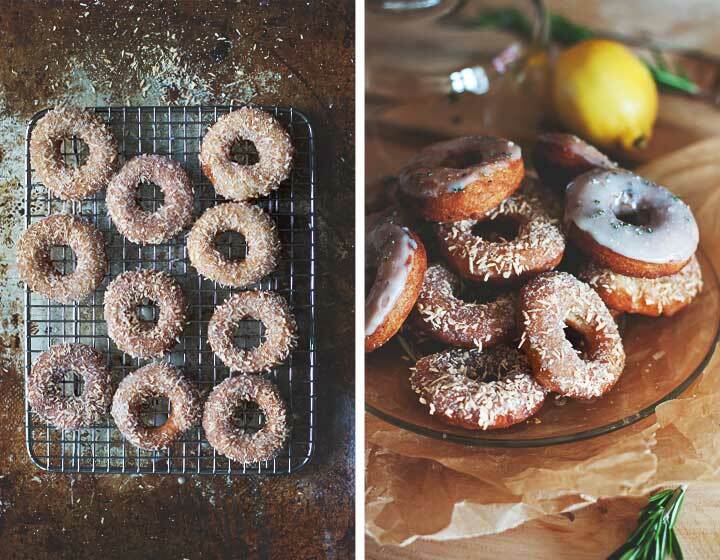 A plain doughnut from this recipe had a stronger lemon taste than I had expected, but it actually worked well and brightened the flavors we added. It worked especially well with the blueberry and rosemary. Relaxing with my niece was a nice way to finish the day. And having a little hill of fried doughnuts to eat the next chilly-blue morning was worth all our effort. You are currently browsing entries tagged with Donuts at Chickypea.